Originally placed in a genus of their own, azaleas are now considered to be a form of rhododendron. Azaleas can be divided into deciduous and evergreen types, and are mostly native to hilly areas with damp acidic soil. Their brilliant flower colors have made them a sought-after shrub for centuries. Azaleas are members of the heath (Ericaceae) family, an ancient group of plants dating to 70 million years ago. They are related to rhododendrons, blueberries and pieris. Most azaleas we are familiar with today are descended from Asian shrubs, and were originally cultivated by monks of the Buddhist monasteries. When seeds of the Rhododendron luteum were sent to England from the shores of the Black Sea, it became parent to many azalea hybrids. The azalea is the national flower of Nepal and is mentioned in ancient Chinese medical texts. Bai Juyi, a Tang Dynasty poet born in 772 A.D., loved azaleas and planted them in his yard. One of his poems referred to the plant as "a beauty amidst all flowers." The Japanese traditionally divide the azalea into two classes: Tsutsuji include all those that flower 30 days after the spring equinox; Satsuki include those that flower about 30 days after the Tsutsuji types. 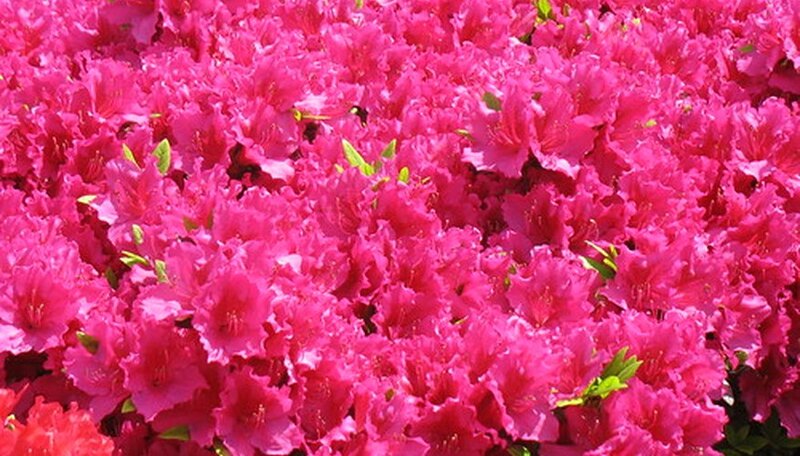 Japanese azaleas made their first appearance in Holland in 1680. Known as Indian azaleas, they became popular greenhouse plants in Germany, Belgium, England and France. There are at least 26 species of azaleas native to North America, including the flame azalea (R. calendulaceum) and fragrant white azalea (R. viscosum), also called the swamp honeysuckle. In the 1990s, two deciduous azalea species were discovered in Alabama. Asian azaleas came to the United States via England. The first hybrids were planted in Charleston, South Carolina in 1848. Callaway Gardens, a resort in Pine Mountain, Georgia, is the site of the world’s largest azalea garden. It was created to protect and preserve native azaleas. Founders Cason and Virginia Callaway discovered a bright orange-red azalea when picnicking near their home in 1930. Their appreciation of its beauty led to the establishment of what would eventually become a 13,000-acre tourist center and garden featuring an “Azalea Bowl” with more than 3,400 hybrid azaleas. In placing azaleas in his plant classification system, Carolus Linnaeus used the number of flower stamens to distinguish between azaleas and rhododendrons. Most azalea flowers have five stamens, while rhododendrons have 10. The classification of azaleas has changed somewhat since the time of Linnaeus. Recently, the term rhododendron has been used to mean plants with large evergreen leaves, and azalea to refer to plants with smaller and thinner leaves. Usually azaleas have more flowers but less impressive foliage than rhododendrons. A Chinese folktale says that a long-ago king was assassinated and turned into a cuckoo. Because of the king’s violent death, the cuckoo sang so bitterly that blood came from his bill. April is the time of the cuckoo’s cries and brilliant red azalea blooms, thus the legend says the cuckoo dyed the flowers red.